I'm still floored by the amount of support I received after announcing my decision to temporarily suspend my weekly menu plans. The truth of it was, I just needed a break. Planning our meals for the week was really helpful because it eliminated the need to have a nightly conversation that started off with "So... what do you for dinner?". It was the writing up of a weekly blog post to share our menu plans that became a huge PITA, especially now that we have an infant in the house. How could I continue planning our meals AND have time to share the menu plans on the blog? To find the answer, I took a cue from my motherhood playbook. Adjusting to being a new parent has forced me to look at things differently, and, above all, it's taught me a whole new lesson in efficiency. It made perfect sense to see if I could find a way to cut out some steps in the menu planning process. After some thought, I realized that it seemed wiser (and more efficient!) to budget time for organizing our meals once a month rather than doing it once a week. 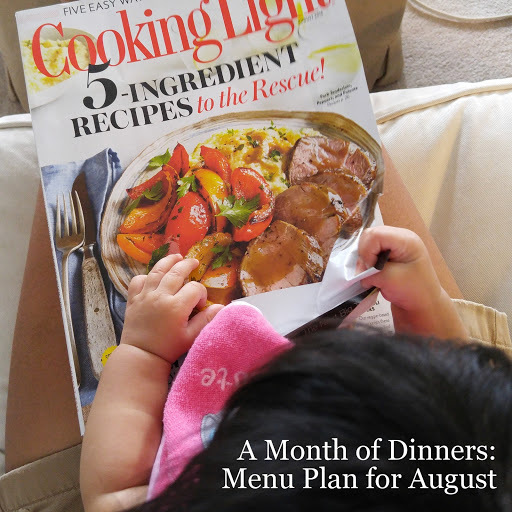 Now that I've seen the light, I'm excited to share some benefits of monthly menu plans, general guidelines for creating menu plans, and our menu plan for August. There's a lot to go over, so let's get started! Planning a month's worth of dinners requires a bit more time upfront, but it ultimately saves you a lot of time down the road. For me, this means I only have to search for inspiration on my favorite blogs or in my collection of cookbooks or in my file of saved recipes I've pulled from magazines once. Planning for a month at a time can also save you money at the grocery store through bulk buying. If you're a diligent shopper, you can watch for sales and be on the look-out for specials on items that you'll need in a few weeks. Plus, say you're going to make multiple meals in one month that call for browned ground beef. Buy the meat in bulk, cook it all at once, and then portion it out for the individual meals. Refrigerate any meat you plan on using within a few days and freeze the rest for later. In short, creating a monthly menu plan can save you time, money, and work. I'm honestly shocked that I didn't start doing this a long time ago. Make note of any special events (birthdays, anniversary, dinner parties, etc.) and holidays. This way, you can decide whether you want to mark those occasions with a certain meal. Look at the days/afternoons that are particularly busy and plan easy meals on those nights. This is especially helpful when you're trying to cook dinner around multiple schedules. For example, when Stephen is traveling for work, it doesn't make sense for me to make complicated meals for just me. On those nights, I'll stick to meals that I can put together in 20 minutes or less. Plan Leftover Nights. No one will think less of you, I promise. Add meals for the remaining nights, alternating meatless with meat or varying the proteins from night to night. The important thing to remember is that this is just a plan. It's not set in stone. Things come up and Life Happens, so be flexible and comfortable enough to alter the plan over the course of the month if you need to. * I originally published our menu plan in a nifty-looking table. When I saw that the table didn't display well on mobile devices, I came back to reformat everything. My apologies! What do you think about our new monthly menu plans? I'd love to hear your thoughts, so leave me a comment below!